It’s the beginning of another month and almost the end of a year. November is a month filled with changing leaves and a changing season. 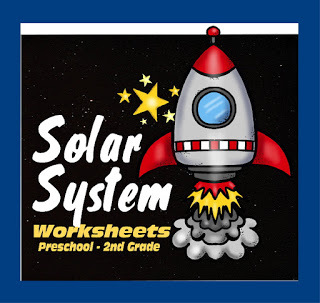 School is in full swing and it is just the right time to add in a bit of daily fun and learning. 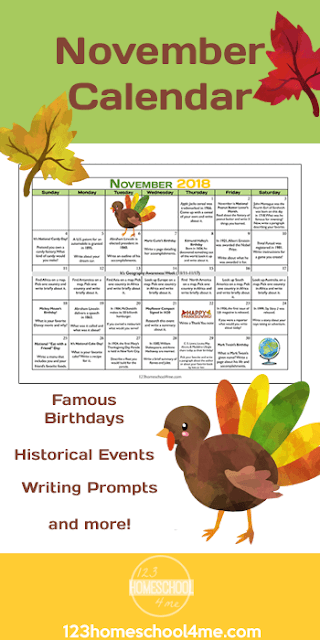 This month you can fill each day with a famous birthday, fun fact, or historical even all tied to a writing prompt with this Free November Calendar. Daily Warm Up: Gather the kids together for a little circle time. 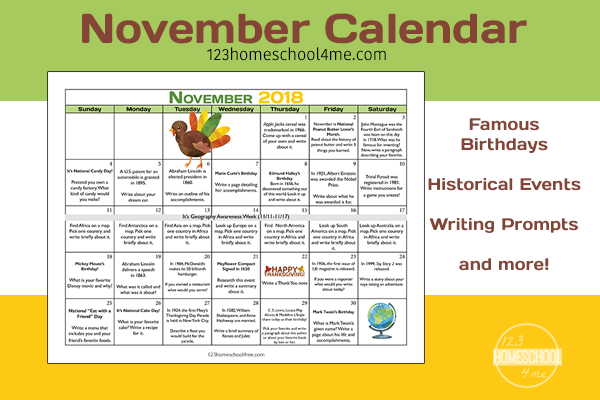 Just take five minutes to look at the daily prompt on the calendar. The kids can look up more on C.S. Lewis or discuss what kind of cereal they would create! Writing Prompts: Each day comes with a writing prompt for the fact, event, or person highlighted. You can have your child write a simple paragraph each day to practice their writing skills. Report Time: Instead of writing a brief summary or paragraph daily, your child can explore a topic or person in depth and write a full report. He can still enjoy the daily facts, events, and people, but focus on writing a report on one item he chooses. Geography Awareness Week: Get out the maps! November 11th through November 17th is Geography Awareness Week. Each day focuses briefly on one of the seven continents. Take time and expand on this each day that week and explore the continent in depth. Whether you use this to get the learning juices flowing or to practice writing your kids are sure to have a fun month!